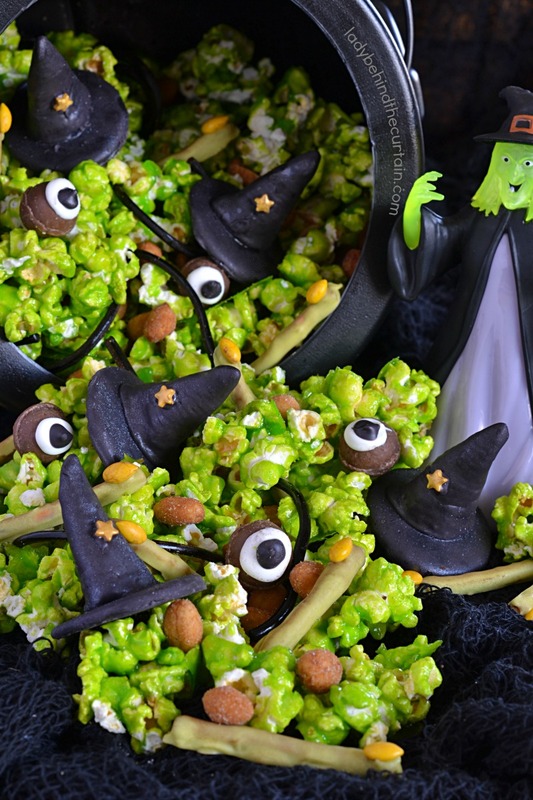 Melting Witch Candy Popcorn Halloween Party Mix | A fun party mix with the perfect sweet and salty combination. Like green apple flavored popcorn, chocolate, candy coated pretzels, peanuts and more. Unlike the Wicked Witch of the West from The Wonderful Wizard of Oz, when this witch melted she left some of her body parts behind. 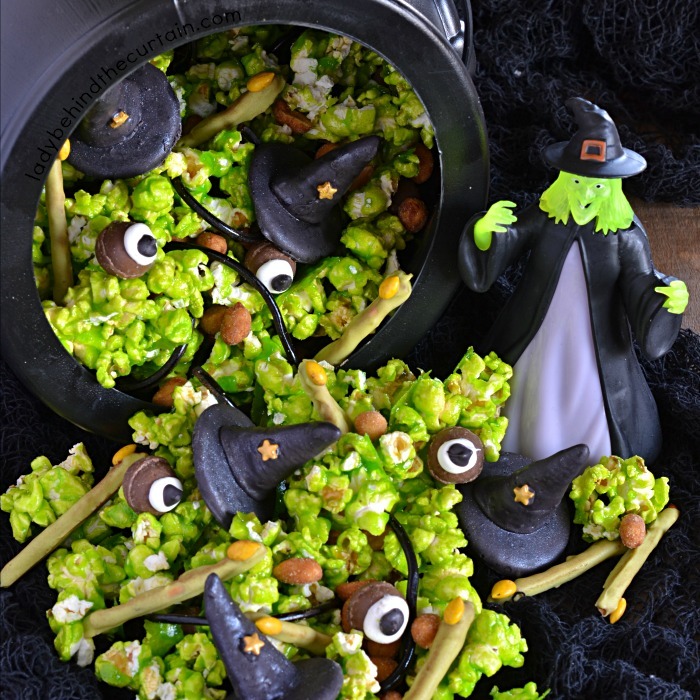 Pack this Melting Witch Candy Popcorn Halloween Party Mix up to hand out as party favors or pour it into a large bowl as a party treat! NOT JUST FOR KIDS! Adults will love this mix too! The witch hat is by far my favorite! It’s a treat all on its own and really gives the party mix that extra something something. 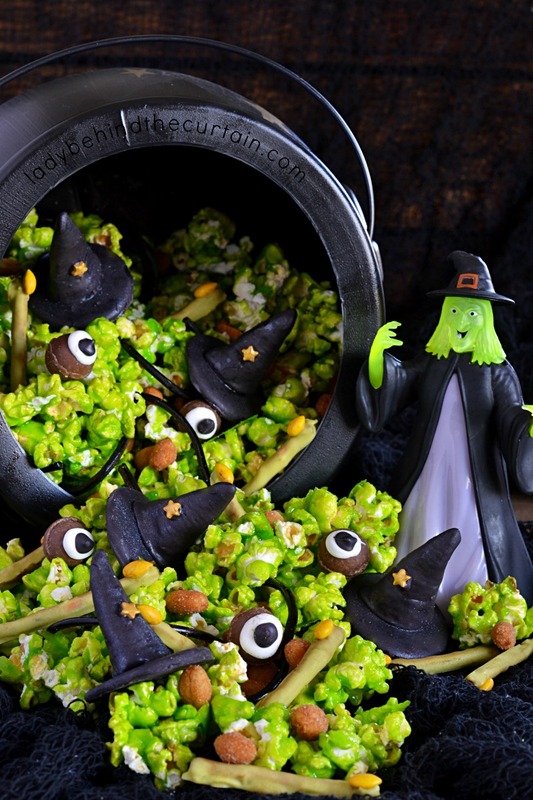 The hats can be made days in advance and kept waiting on the sidelines to be added to the Ultimate Halloween Party Mix. 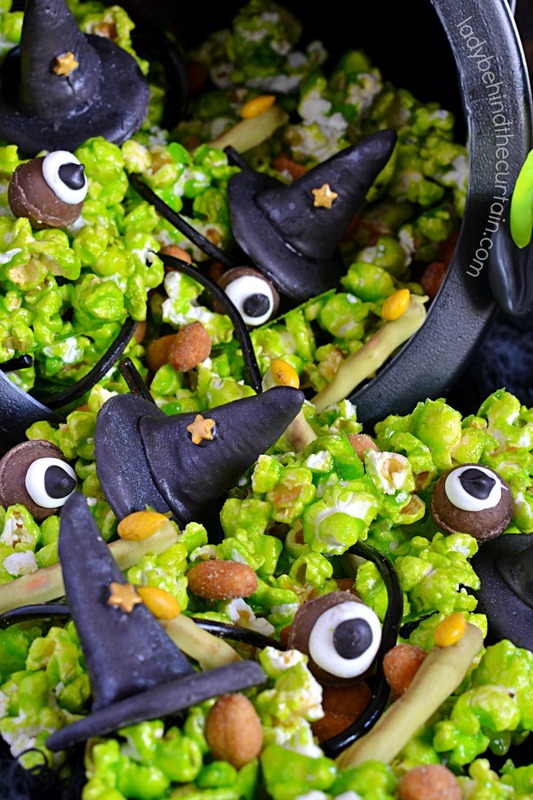 Click here to find out how—->>>>EDIBLE WITCH HAT. The kids are going to go crazy over the sweet green apple flavor of the popcorn. The fingers are fun too! Small pretzel sticks dipped in melted lime green candy, with a candy coated sunflower seed for the fingernail all brushed with cocoa powder. 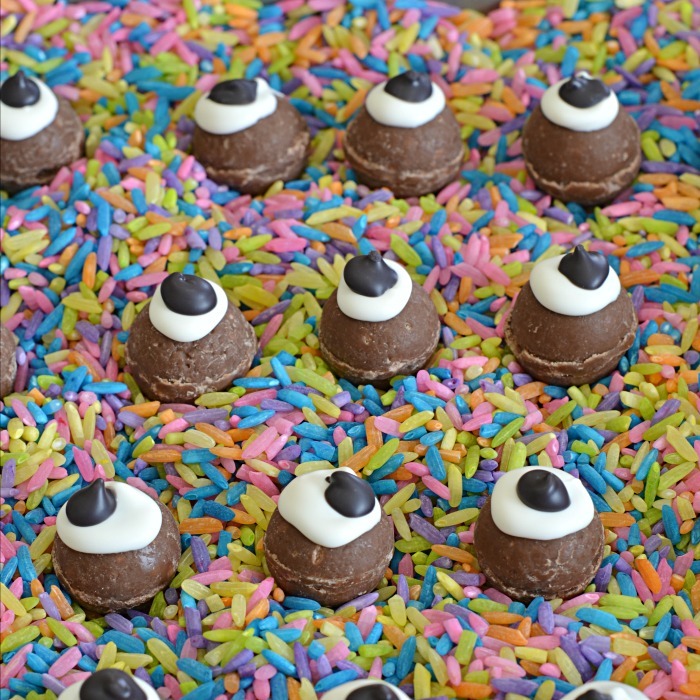 The eyeballs are made from round chocolate balls a dollop of white melted candy and black melted candy for the center. Sprinkle in some black licorice and honey roasted peanuts. 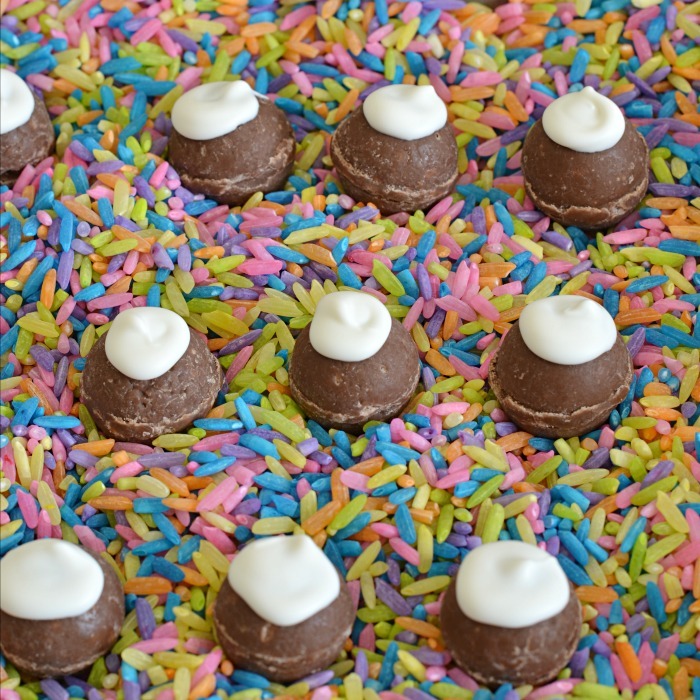 Place the chocolate balls in a bed of rice, add a dollop of white melted candy. Add a dollop of black melted candy, set aside to harden. ALL THESE DELICIOUS TREATS CAN BE MADE DAYS IN ADVANCE BUT SAVE THE POPCORN UNTIL THE DAY BEFORE YOUR PARTY. YOUR GUESTS CAN CUSTOMIZE THEIR MIX! 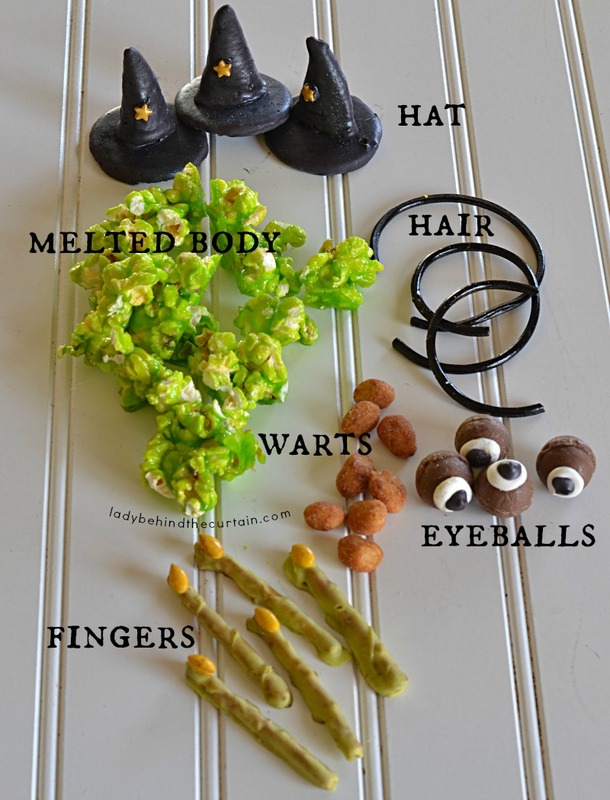 By adding all these different ingredients to this Melting Witch Candy Popcorn Halloween Party Mix you make it easy for everyone to find a few things they like and make their OWN MIX from your mix! FUN! Microwave popcorn, pour into a large bowl. Preheat oven to 300°. Line a jelly roll pan with foil, spray with non stick cooking spray and set aside. Place butter and syrup in a sauce pan on medium heat. Stir until butter is melted. Add Dixie Crystals granulated sugar and Jello and stir to combine. NOTE: If you opt to add more food coloring this is the time to do so. Increase the heat and bring to a boil. Then reduce heat so it just simmers. Continue simmering for 5 minutes. After the sugar mixture simmers for 5 minutes, immediately pour over popcorn in bowl. Mix right away and keep stirring so all the popcorn gets well coated. Spread popcorn mixture onto prepared pan and spread out evenly. Bake for 10 minutes. As soon as you can touch the candy break it into pieces, making sure to break apart the big chunks that are thick with candy. In a medium microwave safe bowl, melt Lime Green Wilton Candy Melts on high 1 minute, stir, continue on 70% power 30 seconds, stir until melted and creamy. Dip pretzels in melted candy making sure to cover the pretzels, transfer to a cookie sheet lined with parchment paper to harden. The perfect tool for dipping pretzels or cookies is the Three Prong Fork from Wilton. You can also use a fork. Dip the flat side of the candy coated sunflower seed into the melted green candy and place at one end of the candy coated pretzel. Place the cookie sheet of pretzels in the refrigerator to harden (about 15 minutes). When candy has hardened brush some coco over the top to give the pretzel a dirty look. In a small microwave safe bowl melt white candy melts. Pour melted candy into a squeeze bottle. Also melt the black candy and pour into another squeeze bottle. Add a dollop of white on a round piece of chocolate and black in the center of the white. To make the drying process easier, pour rice into a baking pan, press eyes into the rice. Place the baking pan into the refrigerator to harden (about 15 minutes). Add honey roasted peanuts (warts) and the black licorice strings (hair) to the mix. Add all the fun ingredients to a large bowl! You went above and beyond. This is utterly fantastic! Hocus Pocus on the television and popcorn candy bar to make their own mix. Kids would be in heaven this Halloween. This popcorn mix is too much fun! I love all the elements you put in here!